I just can't think of anything to witty to say about such an...unwitty headline. 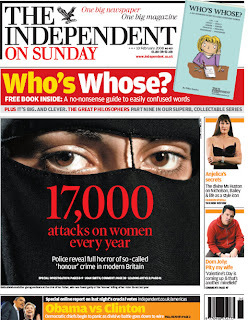 So are Muslim women the only victims of attacks in Britain? Why is the report out only now that there is this bug hullabaloo about Sharia? Is everything else in Britain in tip-top shape and the only problem left is the Muslims? True. It's definitely all about timing :) But, keeping a long story short, I have to say that I am completely against implementation of Sharia in Britain. Me too, it all sounds a bit silly. Then again, this is all a completely silly debate isn't it?